Two of my favorite superheroes of all time are Batman and The Flash, so purchasing the new re-launch of The Justice League was by no means a major twist of the arm. 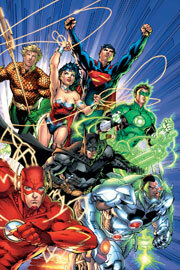 In this day and age of the four dollar comic book, I felt that DC was putting their best talent together for their re-launch projects and I was sold on a Geoff Johns and Jim Lee collaboration. I was a major fan of Johns' work with The Flash because he did an excellent job in examining the backgrounds and complicated friendships of the Rogues. Lee's artwork for the Batman 'Hush' arc was fantastic and it was that series that got me hooked on collecting anything and everything Batman related.Together, they deliver an action-packed opening issue to see how the band actually got together. Johns sets the story in Gotham where a strange race of aliens have terrorized the city. Ah, poor Gotham. Somehow, the citizens do not think twice about moving out due to the alien invasions, murderous psychopaths, and evenings filled with endless explosions. Batman is on the case, as usual, and tries to capture an elusive alien. However, the Gotham PD (better equipped than the US Army or Marines) wants to take out both Batman and the alien. Enter Green Lantern. After reading a few panels of Lantern and Batman dialogue, I was wondering if Batman was talking to Hal Jordan or Peter Parker. With a few magic ring moves, Green Lantern is able to protect Batman and to put out the fires caused by the battle involving Batman, the alien, and the Gotham PD. I need to sidetrack the reader for a moment. If you've read the story then you're familiar with the panel where Green Lantern is able to create some firetrucks and firefighters to put out the numerous fires in downtown Gotham. That was nice of him to help the people out in a time of crisis. 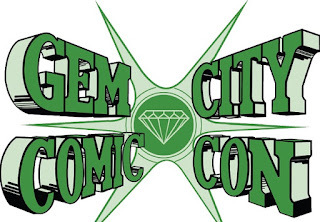 Could Green Lantern also have created a giant apartment complex for the homeless and a grocery store for the hungry? Just wondering. Back to our tale! Batman and Green Lantern follow the alien to the sewers to discover that the aliens are basically Darkseid's suicide bombers. After some witty banter between Green Lantern and Batman, the two decide to check out the alien being known as Superman in Metropolis. A confident Lantern is given quite a welcoming punch from Superman and Johns ends the story with Superman giving Batman a "You wanna fight or what?" ultimatum. Overall, the story is fun and Johns has set the stage for what could be a cool fight between Batman and Superman. In case you're wondering, Lee's artwork is nothing less than what you expect, so discuss amongst yourselves. For those of you that were horrified by the Ryan Reynolds Green Lantern costume then you should feel better knowing that they have stuck with the old-school style of the outfit. Superman's look has been changed and DC has decided to get rid of Superman's red underwear. It's not easy to appease the masses, but I give The Justice League a stamp of approval for keeping the reader interested and wanting more.